There’s something special about reading a book in the setting it was originally written in. Whenever travelling to another country I try not only to study as many travel guides as possible, but finding one or two novels written by a local that I can take with me and read in the author’s natural habitat, usually giving the entire reading experience a much greater depth. When coming to Prague there are a countless number of books you can opt for – from The Trial by Kafka, The Unbearable Lightness of Being by Kundera, The Prague Tales by Neruda to anything from Hašek, Havel or Hrabal. And Shakespeare and Sons is where to buy them. 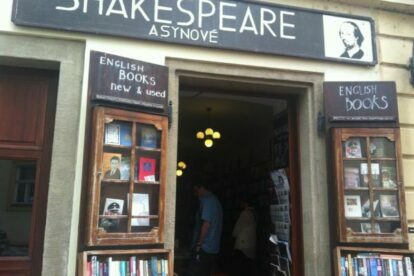 While I am unaware of any connection with the famous Parisian English-language bookstore, Shakespeare and Sons offers a similar service in the Czech context. With a shop conveniently located along the main tourist route just minutes from the Charles Bridge, one can pop in for a hand-picked selection of literature of various genres, from brand new fiction, to classics both Czech and from abroad, as well as plenty of books about history and economics. If it’s a hot summer day in the Little Quarter and you need a break from the hordes of tourists randomly bumping into things, not unlike molecules, with disregard for theirs or anyone’s safety, march into “Shakes”, relax in their cellar reading room and stock up on some local author’s before heading back into the jungle.